During major tournaments like Euro 2016, there are plenty of opportunities to claim some big bonus offers. Right now, the biggest betting sites are sizing each other up to serve the most competitive deals. For football fans, now's the time to take advantage of them. With this helpful advice, punters should be able to locate and capitalise on all the best bonuses offered during Euro 2016. The leading operators have the strongest grasp of technology, meaning they're more likely to use it for tailored offers. 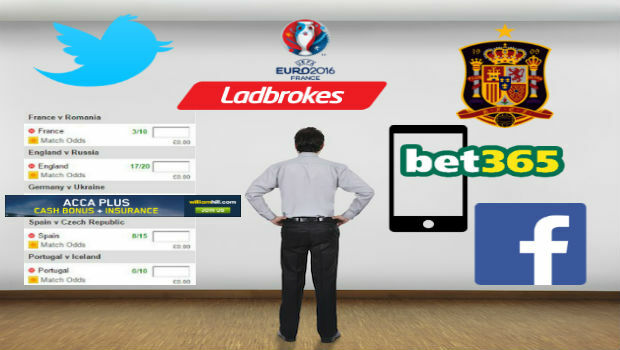 Rather than solely award free bets, some will plan deals where new players get enhanced odds for placing an opening bet. For example, backing a highly favoured team like Spain against a minnow could result in the odds being enhanced to 5/1. These deals are not available to existing users, so you have to be willing to switch to find them. Enhanced welcome odds can be difficult to encounter, as operators can limit how often they use them. Basically, the best approach is to routinely visit the homepages and promotional sections of sports betting sites. Bet365 is one of the most recognisable brands for half-time advertising, with the operator responding to in-game outcomes and sharing enhanced in-play odds with players. For those who see the adverts, it can be possible to take advantage with a 'first goal-scorer' bet or to back a team to make a second half comeback. Deposit bonuses still have an integral role within football betting, but now there are many other types of deals to consider. Fans just have to open themselves up to new possibilities before they can benefit from ACCA (accumulator) deals and money back specials. Look out for these deals by viewing the banners and promotional pages on your preferred sports betting sites. It’s true that ACCAs (accumulator bets) are more complex next to single-game betting, but it can be worth the extra effort when there’s money back insurance for one team losing. Euro 2016 is also a good time for finding team-based deals, which can include free bets if a punter loses their qualifying wager. In both cases, the risk is lessened if the insurance bonus is triggered. The quality of a bonus is not determined by its value alone, as terms and conditions will factor into the process. By viewing them, it will be possible to discover any potential hindrances before claiming an offer. For instance, some players might not want their bonus to be divided into separate free bets. There will be others, however, who don’t want to stake their entire bonus on one same bet. Fundamentally, this is a matter of preference among players. A more important term will be the minimum qualifying odds, which are typically set at 1/2 by the major operators. Every new player wants to win on a free bet, so they will often turn to the more likely outcomes. Just be sure to check that the qualifying odds are at approximately 1/2. The final issue to touch upon is payment methods, as some sites will not allow specific providers to participate. Web-based methods such as Skrill, Neteller and paysafecard can often be excluded. Social media pages cannot be overlooked, as betting sites use these to communicate with their audience on a daily basis. By liking them on Facebook or following them on Twitter, it’s possible to stay aware of the very latest offers. In fact, there will even be times when sites share social media exclusives as rewards to their fans. Just remember, though, that major operators can have individual social media accounts dedicated to their various betting channels. Therefore, you might have to seek out a sport-specific page to see offers relevant to you. Additionally, operators might also maintain an account that focuses entirely on promotions. Fortunately, it’s a simple matter of using the search bar to explore a brand’s presence on social media platforms. Simply type their name in and look at what starts to appear below. One of the easiest ways to find offers is to receive text messages, as they will contain direct links and/or promo codes. This approach is extremely efficient because you can evaluate the offer in seconds before choosing whether or not to claim. Initially, it can be worth receiving promotional messages, but operators will also give players the chance to opt out. Compared to text messaging, email offers are more likely to be overlooked, especially if a spam filter buries them. It might be worth checking junk mail to see if any special deals are waiting. Check out Ladbrokes Sports now for an array of bonus offers all through Euro 2016!